Yale-New Haven (Conn.) Health System, a $4.2 billion system with more than 20,000 employees, has expanded into neighboring states in recent years. Yet it is under financial pressure like most academic medical centers. 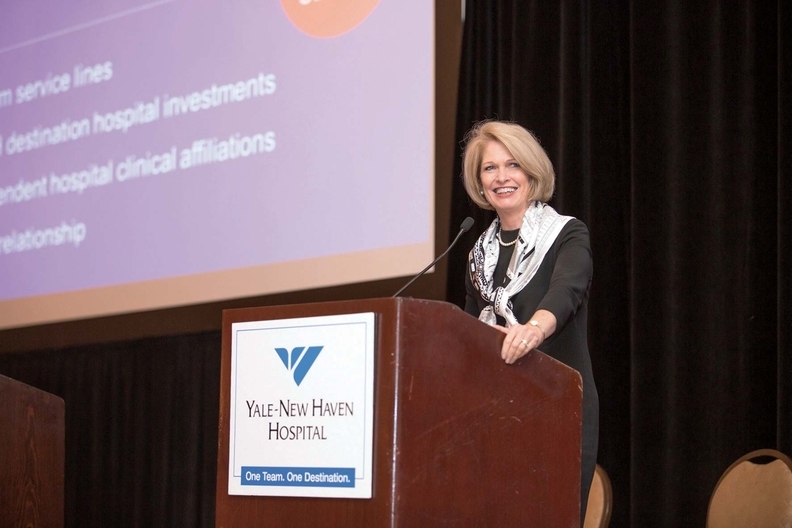 In an interview with Modern Healthcare reporter Dave Barkholz, CEO Marna Borgstrom, who took the top job in 2005, spoke about Yale's approach to value-based care, expansion and how medical training is changing. This is an edited transcript. Modern Healthcare: What are your two or three top priorities for 2016? Marna Borgstrom: We have one key strategy throughout the system and that is to provide unparalleled value to the patients and families we're privileged to serve. And there's a lot in that. The numerator of value is making sure that we really get patient safety, the clear definition of clinical quality and the patient experience right. The denominator is getting the cost/price point that people must pay for right. If we can really focus on the elements of what it takes … to provide great value in healthcare, we will be able to be successful whether we continue to move forward under some sort of modified fee-for-service bundle or ultimately move to some total cost-of-care payment methodology. MH: Academic medical centers tend to be expensive. How do you make sure that you are providing that value for patients? Borgstrom: Academic medical centers have to be great community hospitals. A large part of what any of us do is provided to patients in a fairly regional geography. We also need to build out and link innovative research to innovative patient care. We need to build out elements of key service lines that are going to continue to distinguish us as an extraordinary sick-care system as well as a healthcare system. There's a lot of additional cost in doing that. It's very difficult to quantify the cost of training people in graduate medical education. It's the cost of running some of the region's only available tertiary and quaternary- care services that are there on a 24/7 basis. There isn't a recognition of those costs being embedded in the overall cost of an academic medical center. MH: Have you built out your delivery network to the extent that you would like? Borgstrom: We're building out a regional delivery network that has a reach into New York state, southern Massachusetts and western Rhode Island. It isn't one size fits all. In some cases, we have done that with hospitals and physician practices that are corporately part of the Yale-New Haven Health System. In more than a handful of other cases we have done clinical affiliations with hospitals and community physicians in geographies throughout the state to make sure that we have broader access points and that we can bring some of the academic medical center services more effectively into those communities. And in the case of each of the geographies where we have an owned-system hospital, we have an expectation that each of those local delivery networks is working to build out—either through ownership, partnership, contract—a full system of care so that we can focus on primary and preventive and ambulatory care through either owning or having special relationships with long-term-care providers. MH: Is reimbursement for academic medical centers getting better or worse? Instead, it just seems to be, let's push patients into observation, let's consider taking down part of the 340B drug discount program, which is essential to most academic medical centers. It feels like some death by many different cuts without really stepping back and looking at the hard and very big policy issues. Listen to the full interview with Marna Borgstrom. MH: What do you listen for when you listen to the presidential debates? MH: How is medical education changing at Yale-New Haven? Borgstrom: Yale used to have a fairly traditional model that was built on two years of basic science and true academics, and then two years evolving into the clinical arena. Now, like most medical schools, that's been turned on its ear. When students start they are immediately engaged in the learning of clinical practice as well as the science of healthcare. That makes both more real, more relevant to them. The Yale Medical School Mission And Vision Statement, which they redid a year or so ago, put in a focus on team-based learning and training, recognizing that, unlike the physicians who were educated in my generation who were taught and reinforced to be the most knowledgeable and the right person, the captain of every ship when they were caring for patients, the emphasis now is on there's a big team of people who are working with you, and you need to be aware of them, you need to engage them, you need to rely on them. MH: Is there anything that keeps you up at night? Borgstrom: There are a lot of things that keep me up. One is creating rationality in the way in which we're paid for healthcare. The dominant way we're paid is discounted fee-for-service. I worry that we not pull the lever that moves us one way or the other dramatically without understanding what that means and what the implications are. Another thing that worries me is getting to a clear definition of patient quality, clinical quality and safety in a way patients can understand it. And a big thing I worry about is the workforce going forward because we are going to have shortages again of not just bodies, but of well-trained people who have kind of the emotional orientation to be in healthcare. This article has been updated to indicate that Yale-New Haven (Conn.) Health System is a $4.2 billion system with more than 20,000 employees.